A good book may have the power to change the way we see the world, but a great book actually becomes part of our daily consciousness, pervading our thinking to the point that we take it for granted, and we forget how provocative and challenging its ideas once were-and still are. The Structure of Scientific Revolutionsis that kind of book. When it was first published in 1962, it was a landmark event in the history and philosophy of science. Fifty years later, it still has many lessons to teach. 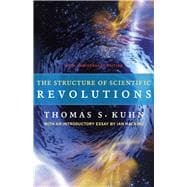 With The Structure of Scientific Revolutions,Kuhn challenged long-standing linear notions of scientific progress, arguing that transformative ideas don't arise from the day-to-day, gradual process of experimentation and data accumulation but that the revolutions in science, those breakthrough moments that disrupt accepted thinking and offer unanticipated ideas, occur outside of "normal science," as he called it. Though Kuhn was writing when physics ruled the sciences, his ideas on how scientific revolutions bring order to the anomalies that amass over time in research experiments are still instructive in our biotech age. This new edition of Kuhn's essential work in the history of science includes an insightful introduction by Ian Hacking, which clarifies terms popularized by Kuhn, including paradigm and incommensurability, and applies Kuhn's ideas to the science of today. Usefully keyed to the separate sections of the book, Hacking's introduction provides important background information as well as a contemporary context. Newly designed, with an expanded index, this edition will be eagerly welcomed by the next generation of readers seeking to understand the history of our perspectives on science. Thomas S. Kuhn (1922-96) was the Laurence Rockefeller Professor Emeritus of linguistics and philosophy at the Massachusetts Institute of Technology. His books include The Essential Tension; Black-Body Theory and the Quantum Discontinuity, 1894-19l2; and The Copernican Revolution.